On January 8, 2012, PFLAG founder, Jeanne Manford, passed away at the age of 92. An article excerpted below, written by Tom Owens, of tolerance.org in 2005, and found in PFLAG National's website (Jeanne Manford's Story) is a touching tribute of a mother's activism and indomitable love for her gay son. One mother's support and acceptance of her gay son led to the creation of a national support group for gays, lesbians and their families. Jeanne Manford needs few words to make the most complex questions simple. "I loved him," she said of her son, Morty Manford. "He was my son." That love and pride inspired Manford to co-found the internationally-known support group Parents, Families and Friends of Lesbians and Gays (PFLAG) in 1973. "Of course, I knew Morty was gay," Manford explained. "He didn't want to tell me. I told him that I loved him, and nothing else mattered. At first, there was a little tension there. He didn't believe I was that accepting. But I was." In 1972, Morty was punched, kicked and thrown down an escalator during a gay rights protest at the New York City Hilton Hotel. Manford and her husband watched the attacks on the evening TV news, outraged that police officers appeared to ignore the assault. Manford's next steps erased any doubt her son may have had about her loyalty and acceptance. She tried to call The New York Times to expose the injustice, but says she was hung up on. Next, she wrote a letter to the editor of the New York Post. The letter was published. One sentence jumped out: "My son is a homosexual, and I love him." The next day, she received a phone call from Morty. "You can't believe it [the response]," he told her. "No mother has ever announced to the world her son is gay." Through one letter, Manford and her now-deceased husband Jules were newsmakers. Together, they appeared on the Phil Donahue talk show and more than 20 different TV shows. A 30-year veteran elementary school teacher, Jeanne Manford's activism was quite a risk at that time. "My principal warned me that there were complaints from parents," she said. "She told me to be discreet. I told her this was my private life." The principal retreated, opposition faded and Manford's life as an activist continued through her 1990 retirement from education. She wasn't alone in her efforts, either. Manford noted that her husband was an active supporter of Morty and PFLAG. Remembering when her husband faced the realization that his only son was gay, Manford admitted he didn't enjoy the same quick calm of acceptance. "He talked about a huge knot in his stomach at first," she said. "[But] once Morty had friends over to the house and Jules talked to them, he became very comfortable." Manford, 84, laughed remembering her elderly mother's reaction to Morty's coming out. "My mother was advancing in years," she said. "When Morty told her, she replied, 'You're gay? I'm Hungarian.'" As for herself, Manford said she had never known a gay person before. "Gay?" she asked. "I grew up in a family of five girls. The word wasn't in my vocabulary." Manford's son invited her to march with him in the Christopher Street Liberation Day March in June 1972. She agreed, accompanying him to the parade and carrying a sign to explain why she was there. The poster board read in large capital letters: PARENTS OF GAYS: UNITE IN SUPPORT FOR OUR CHILDREN. Today, that sign is part of the Gay and Lesbian Collections of the New York Public Library archives. When the parade began, Manford didn't understand the initial cheering. She believed the ovation was intended for the marcher behind her, noted parenting advocate Dr. Benjamin Spock. However, once crowd members ran into the parade route to talk to Manford, she realized the cheers belonged to her. 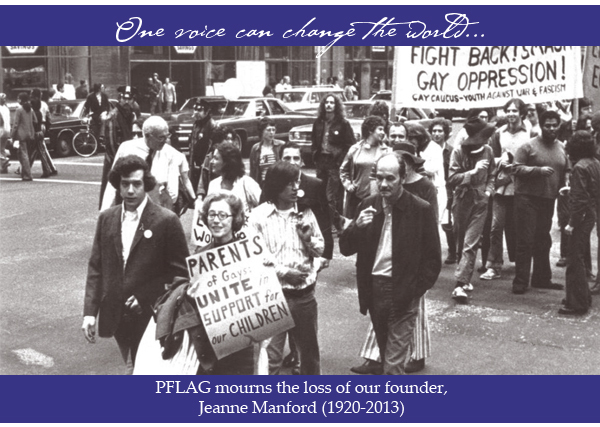 PFLAG NYC distributed their statement about the passing of PFLAG Founder, Mrs. Jeanne Manford. During the march, mother and son agreed that a parents support group was needed. In 1973, the first meeting was held at the Metropolitan Duane Methodist Church in New York City. Since then, PFLAG has gained international representation, with more than 200,000 members and supporters included in 350 chapters. Phyllis Steinberg, New York City PFLAG president, recalled Manford in 2003, as guest of honor at an awards dinner. "I still get chills from the ovation she got," Steinberg said. "The mass sense of gratitude for all she had done, the gratitude to be in the presence of this woman. She didn't have to say a word." Steinberg's admiration for Manford goes beyond fellow activist. She commended Manford, one parent to another. "What can be a greater expression of a mother's love for her son than to stand up for that child in the face of such great adversity?" she asked. Ron Schlittler, former PFLAG deputy executive director, explained how family members often begin their chapter involvement. "It's parental. It's an instinctual response to protect their own children," he said. "So many parents are not born activists. They don't come by this naturally." Schlittler related that most PFLAG chapters have started like Manford's 1973 efforts, when one parent wanted to aid a son or daughter. "Every chapter has its own Jeanne Manford. They are honored and treasured people." Takenori (Tak) Yamamoto, Japanese-American gay activist, passed away on Friday, November 9, 2012, at his home at the age of 74. We honor Tak's life as one of our influential API LGBT pioneers. Tak was openly gay most of his life, including during his service in the U.S. Air Force. He retired from the Los Angeles County Voter Registration Department. Tak was greatly involved with the Asian Pacific Lesbian and Gay Association, which was the first such API LGBT organization in the nation. Its co-chairs were June Lagmay and Dean Goishi. Tak later became its first President. Tak served as the first openly-gay President of a Japanese American Citizens League (JACL) Chapter and was instrumental in having the JACL endorse gay marriages at their national convention beginning in 1994. In 1990, Mr. Yamamoto was one of 2 gay Japanese-American persons featured in a Tozai Times article, "A Minority Within a Minority". The now-defunct publication described Japanese-American gays and lesbians living previously indivisible lives within their ethnic community. The article was significant considering the period of the 1980s- 1990s was a time when there was practically very little tolerance or public support of gays, much less Asian-American gays. A few years later, Tak worked with May Yamomoto (not related) in forming the Lambda Chapter of the JACL, which was the first LGBT chapter for the civil rights organization. In recent years, Tak Yamomoto was honored by the Southern California Japanese-American Historical Society and by the API Equality Los Angeles organization in their Pioneers Project. Since its inception in 1970, Tak has also been a member of the Manzanar Pilgrimage Project. Bruce Embry, Manzanar Committee co-chair, described Tak as a devoted community organizer who was a fighter, whether it was a struggle for full redress and reparations, or a staunch advocate of LGBT rights. Other adjectives furnished by Bruce were: "thoroughly organized, tireless, fearless, committed, determined, loyal, but patient, as well." A strong Democrat, Karl Fish, Tak's partner of 46 years, took Tak to his home precinct for the last time, so that Tak could turn in his ballot personally on this last election. Our members, Harold and Ellen Kameya, were personal friends of Tak, since the late 1980s when they began their affiliation with the Lambda Chapter of the JACL. Another long-time activist and founding member of SGV API PFLAG, Mr. Andre Ting (Chinese-American), has also worked alongside Tak throughout the Gay Rights Movement.